We get this question a lot. Why should I work with HubSpot? Why do I want to pay for my website when I can create it for free on WordPress? Isn’t it the same thing as Marketo/Pardot/Lead Lander/insert your choice here. I have great answers to this question, but first, I want to set some context. We talk to a lot of software and technology businesses that are in a unique stage of growth – we like to call it the “getting ready for the next leap” stage. These companies have survived start-up and all the bumps associated with getting a product into the market and getting traction. They are no longer a technology or software application looking for a good use-case. They've found a target market that benefits from their products, they have happy customers, and now they want to grow to the next level. These companies have invested heavily in engineering and sales. Marketing, not so much – and that is where they need to go to reach the next growth curve. At this point in your growth cycle, your technology company doesn’t want to get bogged down in, well, technology. If you attempt to cobble together a system that optimizes your website, creates landing pages and registrations, tracks visitors, provides email and list management, has tools for social promotion and integrates with your CRM system, you’ll end up spending valuable time and treasure trying to make this all work together. With HubSpot, you have a solid platform to build a persona-driven website. By this we mean that most technology sales have multiple buyer types and roles involved. With the HubSpot COS (content optimization system) you can build a website that delivers different content and conversion paths to different buyers depending on their choices and past behavior. 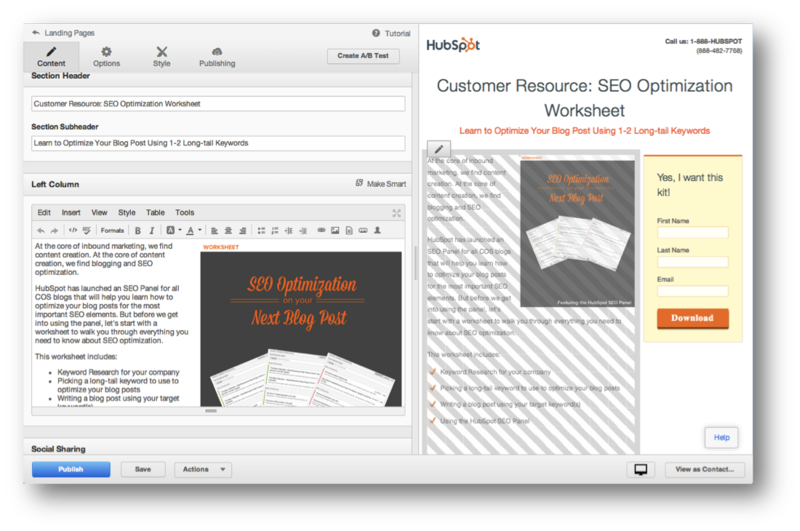 With HubSpot, you have one of the best email marketing engines I have ever worked with. It is complete with marketing automation workflows, triggers, and great analytics. And, unlike many of the-point solutions, HubSpot has a solid approach for managing lists and contacts. With HubSpot, you have a full-fledged social promotion engine that you can configure for automatic posting or fully manual posting. You can post to multiple streams or just one. You can schedule posts in advance. You can monitor and listen to what is being said in the social sphere. With HubSpot, you have all the tools you need to create great-looking and well-functioning landing pages and the calls-to-action needed to drive site visitors. You can also drive email recipients to landing pages, and, once they register, guide them into a predefined workflow. With HubSpot, you have all the analytics necessary to see what’s working and what isn’t. This includes seeing a list of prospects that visited your website but did not register for an offer, which is a very useful feature if you have a sales team that is out networking or developing their own leads because they can track visitors back to their activity. With HubSpot, reporting is easy to understand and almost fun. The built in comparison graphs show you how your marketing is performing month to month or quarter to quarter. Your company can easily see what pages and offers are performing best, and as your inbound content marketing evolves, you can easily see what the best performing sources of traffic are – organic searches, referrals, social, direct, and even paid. And because lead conversion to customer doesn’t happen without a conversation, your growing software or tech company can integrate your sales and marketing teams with the built-in HubSpot CRM. The CRM functionality, strong enough to be highly useful as a stand-alone application, becomes even more useful when coupled with your website and analytics tracking. This gives your sales team real-time alerts when a prospect comes back to visit your site. And unlike most other CRM solutions out there that focus on the manager and reporting first, the HubSpot approach is all about making the salesperson more productive and effective. Finally, because no system can do it all, HubSpot has developed close integrations with numerous vendors and systems that support marketing and lead generation programs, including apps like Go-To-Webinar, Wistea for video, and Zapier for ad-hoc integrations. So, back to the original question we get asked all the time: “Why should I spend $1,000 (or more) a month on my website?” The answer is that with HubSpot, you are getting so much more than a website – you are getting a digital marketing engine and the high performance automobile that surrounds it. All you need to do is add fuel (content) and you are ready to take your business to the next level. You can build a seemingly less expensive alternative, but when you add up all the point-systems costs and then add on all of your time or your staff’s time to manage the ongoing integration needs, you are spending at least $1,000 per month. Why go through the pain of trying to build a better mousetrap when, for the same price, you can have a system that was designed from the outset to do what you are trying to achieve? Would you like to learn more about HubSpot? Complete the form on this page and we’ll set up a 30-minute, non-salesy review of the solution (and we’ll provide you with some feedback on your website as well).